I am very excited to share a conversation with you that took place via email between myself and author Beth Kephart. Beth was the first client of my online publicity company, Winsome Media Communications, but our relationship goes back much farther than that, and I am so proud she chose Winsome to help spread the word about her book. We go behind the scenes of writing a book like Dangerous Neighbors, a book you might consider picking up for anyone you know who loves beautiful lyrical writing and historical fiction. My questions are in bold, and Beth's answers follow. Dangerous Neighbors represents a new area for you in historical fiction. Did you have any reservations about writing historical fiction? The truth is that writing feels empty to me if the story isn’t also taking me toward something I don’t know enough about. My memoirs are full of research and history—Still Love in Strange Places, for example, is about my marriage, but it is also about the history of a country (El Salvador), a war, coffee farming. Into the Tangle of Friendship, about the way my friends have shaped my life, also, oddly enough, took me to Aristotle, Cicero, Thoreau, Cather, and others. Ghosts in the Garden was about finding purpose in early middle age, but it was also about the history of a garden and a town. Flow: The Life and Times of Philadelphia’s Schuylkill River had me digging into Philadelphia archives for years. This is all a long way of saying that I’m happiest and feel most grounded when I am finding out about other places, other times. Of course I am worried, always: Will I get something wrong? Will I lean out of the era with my imagination? But I love the challenge. It's interesting you should say that. Do you think that it's more permissable to "get things wrong" or even take liberties with the history in fiction than in memoir? It’s so entirely cliched to say this, but oh, it’s true: The first order of business—with either memoir or fiction—is to get the emotional truth just right. I’ve written five memoirs and never once did I knowingly stretch the truth or combine four characters to make an approximate composite (as many do) or purposefully make up dialogue (though I confess to not remembering every single word, especially from 35 years ago, which is why I feature very little dialogue in my memoir) or change the chronology or any such thing. But I did, of necessity, choose which parts of the story I told. Artful selection of moments and scenes lies at the heart of the memoir craft; it allows the writer to explore her chosen themes. It also opens the door for someone to say, But you didn’t include that instance in which so-and-so said something. Does not including make something less truthful? Some might say it does. But all memoir—all personal story—is riddled with elision. With historical fiction, I believe you have to get as much of this right as you possibly can. You have to study the photographs, read the contemporary letters, diaries, magazine/newspaper articles, pore over the guidebooks, walk those parts of the city (in this instance) that still exist and try to imagine the parts that have vanished. But at the end of the day, much of what I was writing about is gone, and I can’t stand on a hill and look out and see the Philadelphia of then. I can’t walk through the 1876 cyclorama “Paris at Night” and give it precisely to readers for it no longer exists. One can’t possibly have all the facts one needs—ever, for any genre—but one can do the best one can. With Dangerous Neighbors, I wanted to create a story that felt timeless in terms of its emotional knotting and aftermath, and so I wrote the story in an urgent present tense, didn’t freight the piece with arcane language. But I also wanted to capture as much of historic Philadelphia as I could. There was one detail that I purposefully got wrong; I have an opera singer at the Academy of Music during a year when I know she did not perform at the Academy (she had been there in years previous and would sing again at the Academy in subsequent seasons). I note this discrepancy in the back of the book and hope that readers will forgive me. Dangerous Neighbors is a story about sisters and what happens when sisters start growing up and by necessity growing apart. How did this story come to you and did you face any challenges in writing about twins? I identified tremendously with Katherine, the responsible sister who is expected—explicitly and implicitly—to keep her twin, Anna, safe, and who finds herself feeling excluded and privately raging as Anna develops a relationship that in many ways marginalizes Katherine. I was going through a difficult personal time while writing this book (though not with my own sister). I understood, too well, these feelings of marginalization. I honestly cannot remember when I realized that this story was about twins; creation for me, is a sometimes foggy process, especially in its early phases. But once I had grasped that concept, I utterly embraced the storylines that naturally grew from the twinship. We have all known twins; I grew up with twins as friends and I’ve taught twins as young writers. An empathetic imagination reads between the lines. Many writers have to leave out some historical detail they learned during research because it doesn't fit in the book. What are some of the interesting things you learned that couldn't find a place in Dangerous Neighbors? Oh, my goodness. Books and books worth of details! I had originally written this book from the perspective of the fire that threatens to leap across Elm Street and take down the Main Exhibition Building on the day that Katherine goes to the fair, and so I had included far more about the burning and firefighting. In another version of the book I had alternated chapters between Katherine’s point of view and the point of view of William, the poor young man that Katherine comes to befriend, and so I had all the details that comprised his back story—the story of his mother’s work taking in laundry for the rich, the story of his father’s year in Eastern State Penitentiary, and so much more. I was very, very taken with the material I found on Eastern State—with the kinds of punishments wardens doled out to any who, for example, broke the utter code of silence. It is my great hope that Dangerous Neighbors will sell well enough that I’ll be able to fully write William’s story as a sequel. Wow I am very fascinated by the idea of getting the chance to hear William's full story. I often feel like I don't know enough about history and learning about it through novels is one of my favorite things! I know you've created a teacher's guide for Dangerous Neighbors, as well. You keep a blog that is well loved and respected and I'm amazed at how often you can update with such quality posts! What has the blogging experience been like for you? How is writing a blog different from writing a novel? Well, I am being asked that question by one of the most beloved and versatile and consistent and inspirational bloggers anywhere, so I am struggling to say anything here that you wouldn’t already know about this experience. For me, blogging is a chance for me to solve a puzzle each day—pair a photograph with text, work the interstitial spaces. It is a forum through which I can thank and stay in touch with the many, many goodhearted and wise people who love books and have entered my life through this channel. It is the place where many lasting friendships have been born. In all of those ways, it is different from writing a novel. But in so many other ways, it demands just as much (relentless curiosity, perseverance, zones of poetry), and I am glad for that, glad it exists, cannot imagine my life without it. What are some of books you've read recently that have inspired you? Oh, gosh, I had a great reading summer. Jane Mendelsohn’s American Music thrilled me—stylistically and structurally it’s just a most wonderful book with a tinge of magic and a healing heart. I discovered Elizabeth Hand this summer, through her magnificently written Illyria. I read my first John Green—Looking for Alaska—and I understand now why he is so beloved. I’m halfway through Helen Simonson’s Major Pettigrew’s Last Stand and loving that. I read an early copy of The Report by Jessica Francis Kane, and was deeply moved by that unknown aspect of WWII history. Well, really, I’m a blessed reader, and I’ve blogged about all these books and many more because, well, because I couldn’t help it. Can you tell us what you're working on now? I always have a few things percolating—some more heatedly than others. At the moment, I am writing toward the end of a book that I began three years or so ago; it involves a kidnapping and its aftermath and the surprising paths toward healing. I’ve also been at work for ten years on a novel that takes place in southern Spain; I’ve written this book as an adult novel and as a young adult novel, but it is not fully complete, in either version. And always, in my head, stands William of Dangerous Neighbors. I am very hopeful that I’ll be able to tell his story. I had hoped to write a sequel to Undercover as well, but the opportunity did not arise. One holds one’s breath, for one’s characters. What do you most hope readers take away from Dangerous Neighbors? Hmmmm. Well. I want Philadelphia to be alive for them—the Philadelphia of then, the implied progress, the trembling hope. I want Katherine and Anna and Bennett and William to be alive as well, for their stories to keep living on, past the book. Those characters live on for me. I see them walking the streets. I hear their voices. I guess a writer works, or at least this writer works, toward one end—to give the reader as much of her own heart, mind, vision as words—never enough words—allow. Do you know how Dangerous Neighbors is doing and how it's been received? As for how Dangerous Neighbors is doing—authors learn rather early on not to ask. At least this author has. I am extremely fortunate to have Egmont USA and you and Goodman Media behind this book, and all are spreading the word. It has, from what I can tell from photos that friends are sending from bookshelves across the country, been well distributed. Bloggers have been gracious and kind. I hope that my teacher’s guide will help carry the book into English and American Studies classrooms, and though that is a process that takes time, I have already been invited into a few schools, which delights me enormously. I want the best for this book, urgently, for it is about my city, and it is about things that matter to me (love, loss, forgiveness, redemption), and it is a book in which I took risks, a book that was a risk to publish. Besides, I am so eager to write the sequel that will tell William’s story. But I don’t ask how many copies have been printed, don’t ask how many copies have been sold. One can dream all one wants, but book buyers will do as they will, and once a book is written and copyedited, once one has told those whom one hopes will care, there is very little one can do, and wanting success too fervently, too needily, can sour a mood or an experience. I don’t want to sour my experience with Dangerous Neighbors, or, indeed, with any of my books. Thank you so much for taking time out of your busy life to share with us, Beth! Can't get enough of Dangerous Neighbors? 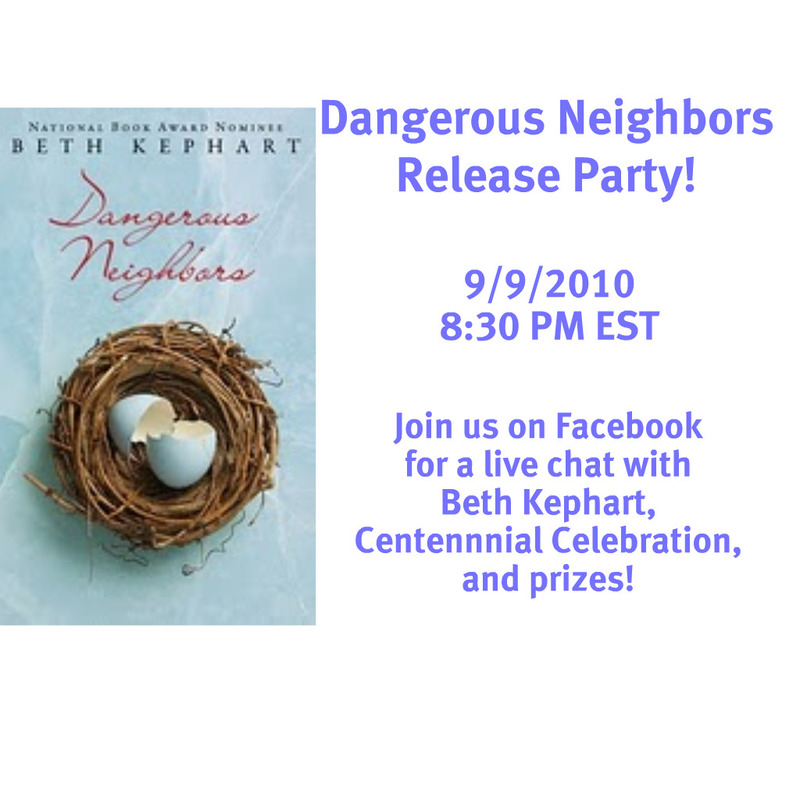 I'm excited to tell you there will be a Facebook Party on Thursday September 9th, at 8:30 PM EST. To join in, just like Beth on Facebook, and show up at 8:30 PM EST/5:30 PM PST to join in a chat and Centennial celebration! 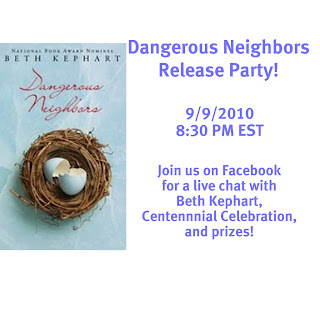 Beth is giving away an AMAZING prize and you'll also have the chance to win a signed copy of Dangerous Neighbors!